Introduction: The clinical features, management, and the associations of dosage in poisoning with the cardiotoxic plant Cerbera odollam (suicide tree), responsible for more than half of plant poisoning deaths in the South Indian State of Kerala alone, have not been evaluated. There are only few studies on its clinical features and none on the usage of cardiac pacing in its management, given its rarity in the Western world. We depend on data for similar toxins to form our management protocols. Aims: Our aim was to describe the clinical features of C. odollam poisoning, dosage, and its relations to clinical features and pacemaker initiation therapy and to study the characteristics of temporary pacemaker therapy in its management. Subjects and Methods: This study was conducted in fifty consecutive cases who presented with a history of C. odollam poisoning from whom clinical data were obtained. Cases initiated on temporary cardiac pacemaker therapy due to the toxin effects were also studied. Effect of dosage on various clinical manifestations and pacing was analyzed. Results: All cases were due to suicidal ingestion. Vomiting (54%), thrombocytopenia (50%), and sinus bradycardia (32%) were the most common features. The need for cardiac pacing had a significant association with dosage in kernels ingested (P < 0.05) and with thrombocytopenia (P < 0.05). There was no association between hyperkalemia and death. Thirty-six percent of cases had to be paced, of which 16% died. In-hospital mortality of odollam poisoning was 12%. Conclusions: C. odollam poisoning cases merit monitoring and treatment in Intensive Care Unit with facilities for electrocardiographic monitoring and temporary cardiac pacing. The clinical features and the factors associated with mortality are different from other cardiac glycosides. Human poisoning with the cardiotoxic plant Cerbera odollam [”suicide tree”, [Figure 1] is common in the muddy river deltas of Southeast Asia and tropical Pacific Islands as far east as French Polynesia. In the South Indian state of Kerala, it accounts for half of the state's plant-poisoning deaths and 1 in 10 of all fatal poisonings. More than 500 cases of fatal Cerbera poisoning between the decade 1989 and 1999 have been documented in the state, but the exact fatality may be much higher, given the failure of detection of the toxin readily by clinical or chemical methods. The rate of poisoning appears to be increasing. It is largely unknown to the western world, given the geographic distribution of this plant. It is astounding that even with such a wide array of clinical features, and such a high prevalence, very little has been studied and documented in the literature. This is an observational study of fifty consecutive cases of odollam poisoning admitted to a Tertiary Care Centre in the State of Kerala, India. The amount ingested, clinical features, electrocardiographic (ECG) changes, hematological and biochemical investigations were elaborated on set pro forma. Correlation has been evaluated between amount ingested, hyperkalemia, and ECG changes; the need for pacemaker initiation, and the outcome of pacemaker therapy has also been studied. The cases were treated with atropine and resistant cases with pacemaker therapy. All the fifty cases were due to suicidal ingestion of C. odollam kernels. We noticed five prominent symptoms, although some cases had a combination of two or more of those [Table 1]. Vomiting was the predominant symptom in more than half of the cases although nearly one-third of the cases were asymptomatic (admitted with a history of ingestion only). An abnormal ECG was noted in 64% cases on admission [Table 2]. The most common arrhythmia was sinus bradycardia. An increase in the occurrence of ECG abnormalities was noted with escalating doses of toxin ingested. A positive association was noted between dosage and the following parameters: (1) ECG abnormalities, (2) vomiting, (3) need for cardiac pacing, and (4) death [Table 3]. The association between dosage and the need for cardiac pacing was found to be statistically significant (with a P < 0.05). The most common hematological abnormality was thrombocytopenia noted in 50% of the cases, and it was positively associated with ECG abnormality and need for cardiac pacing [Table 4]. None of the cases who expired had hyperkalemia. There was no statistically significant association between hyperkalemia and mortality, dosage, or cardiac pacing. Eighteen cases had to be initiated on pacemaker therapy, with a mean duration of pacing of 4.5 days (range 4.5 ± 2.3 days). Sinus pauses with first-degree heart block was the most common indication in which pacing was undertaken [Table 5]. Six cases (12%) expired during hospital stay. The dosage of toxin in those six cases varied from half a kernel to 3 kernels. Sixteen percent of the cases who were paced expired. None of the cases had persistent cardiac conduction defects at the day of discharge from hospital. The clinical profile documented herein widely varies from any previously reported literature. This study is probably the largest till date in terms of its sample size. Vomiting has been documented previously by Iyer and Narendranath, but the occurrence of syncope, chest pain and palpitations has not been described previously. One probable explanation is that, with the advancements in treatment modalities and the emergence of cardiac pacing, cases presenting even with late manifestations are potentially salvageable. Number of kernels of the plant ingested is a useful measure of dosage as it has associations with vomiting, need for cardiac pacing and death. The minimum lethal dose in this study was half a kernel of odollam, in contrast to one full kernel as with previous studies. Thrombocytopenia is noted as a novel finding, not described in previous studies with other cardiac glycosides. Interestingly, it had statistically significant association with clinical features and the need for cardiac pacing (P < 0.05). Physicians should be on the lookout for thrombocytopenia routinely, given its associations. Odollam has been previously evaluated for its anti-cancer properties, and bone marrow suppression may be the reason for the observation. None of the cases who had hyperkalemia died during their course of in-hospital stay. In a previous study of 91 cases by Bismuth et al., primarily with acute digoxin poisoning from intentional overdose, researchers noted that no case with an initial potassium concentration above 5.5 mEq/L (or mmol/L) survived while no case with a potassium concentration below 5 mEq/L died. In the present study, no such observation was made. Cardiac glycosides are a group of drugs of whom the action is known up to the enzyme level, and whether our observation is a pharmacogenetic variation merits further consideration. Finally, the relation between hyperkalemia and death in other cardiac glycoside poisonings may not be directly applicable to odollam poisoning. A multitude of ECG changes was noted with odollam poisoning, the most common of which were sinus arrhythmias, notably sinus pauses. Treating physician should be on the lookout for further emergence of ECG changes. The efficacy of pacemaker therapy in odollam poisoning has not been previously described, although a Sri Lankan study had described pacing in acute oleander poisoning previously. The increased availability of pacemaker facilities in the recent times has definitely brought down mortality. More than one-third of the cases required temporary cardiac pacing stressing that an Intensive Care Unit setting with facilities for continuous cardiac monitoring and temporary pacemaker insertion may be the ideal place for evaluation of any odollam poisoning case. Finally, 16% of cases expired even with cardiac pacing, and we could not find any obvious mechanism in those cases. Given the very little amount of literature published in this regard, and the unfamiliarity of the toxin to the Western world, we suggest that further studies using molecular biology techniques are the need of the hour. C. odollam poisoning common in Southeast Asia and tropical Pacific Islands is a less studied entity. The clinical features and the factors associated with mortality are different from other cardiac glycosides. Such poisoning cases merit monitoring and treatment in Intensive Care Unit with facilities for electrocardiographic monitoring and temporary cardiac pacing. Formulation of management protocols which could be implemented at all levels of healthcare is the need of the hour. 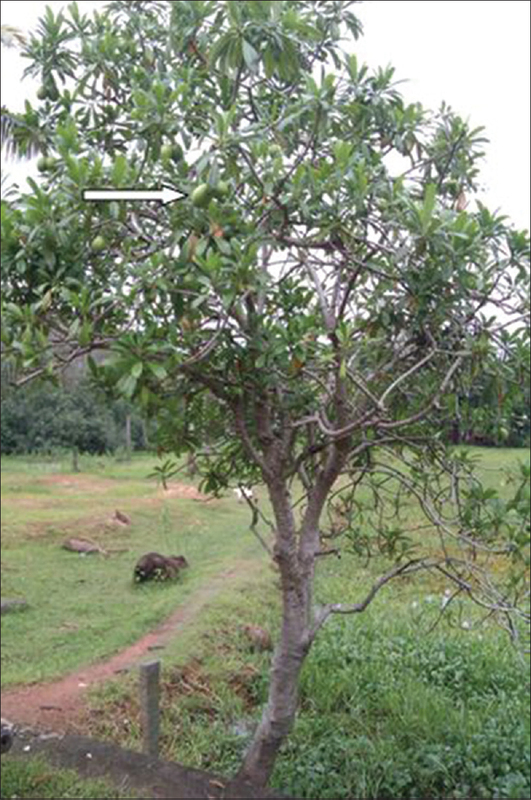 Gaillard Y, Krishnamoorthy A, Bevalot F. Cerbera odollam: A 'suicide tree' and cause of death in the state of Kerala, India. J Ethnopharmacol 2004;95:123-6. Auerbach PS. Wilderness Medicine. 6th ed. United States: Mosby; 2011. Schwartz A, Allen JC, Harigaya S. Possible involvement of cardiac Na+, K+-adenosine triphosphatase in the mechanism of action of cardiac glycosides. J Pharmacol Exp Ther 1969;168:31-41. Iyer GV, Narendranath M. A preliminary report on the neurological manifestations of Cerbera odollam poisoning. Indian J Med Res 1975;63:312-4. Siti Syarifah MM, Nurhanan MY, Muhd Haffiz J, Mohd Ilham A, Getha K, Asiah O, et al. Potential anticancer compound from Cerbera odollam. J Trop For Sci 2011;23:89-96. Bismuth C, Gaultier M, Conso F, Efthymiou ML. Hyperkalemia in acute digitalis poisoning: Prognostic significance and therapeutic implications. Clin Toxicol 1973;6:153-62. Eddleston M, Haggalla S. Fatal injury in eastern Sri Lanka, with special reference to cardenolide self-poisoning with Cerbera manghas fruits. Clin Toxicol (Phila) 2008;46:745-8.